QNet, the controversial, Hong Kong-based multi-level marketing (MLM) operator with multiple names (GoldQuest, QuestNet, QNet, QI Ltd and QI group are the better known names) and identities seems to be working on a clear plan to hide the trail of its Indian operations. Interestingly, worried investors and bloggers or those burned by the pyramid marketing business are doing an excellent job of tracking its operations and publicising them. Here are some such trails gathered through helpful bloggers like Sherwette Mansour from Egypt (http://joinnetworkmarketing.wordpress.com ). According to Wikipedia, QNet’s business model has been described as a simple pyramid scheme, where initial entrants to the scheme do make money, but as the number of IRs increase, finding more independent representatives (IRs) becomes harder and harder, until those that join late are unable to recover even their initial outlay and the model collapses. QNet counters this explanation as offering a business opportunity that doesn't have the high cost of start up as a limiting factor. When an IR recommends the product, the customer makes a purchase through QNet’s online system and the IR receives a commission based upon QNet’s compensation plan. The compensation plan operates by the recruitment of customers by the existing IR. An IR is provided with an ID that gives access to a “Tracking Centre” (TC) in its computer system through which the IR’s sales are tracked. A TC has a left and right customer group. Every customer owns a TC which is then placed on the left or right customer side of the IR’s TC. A ‘direct’ transaction (a customer’s personal reference or sale) is counted as one transaction. An “indirect transaction (someone in the customer’s TC buys/refers/sells) is also counted as one transaction. QNet pays $250 each time three product sales on an IR’s left customer group are matched by three product sales on the right,” says Wikipedia. 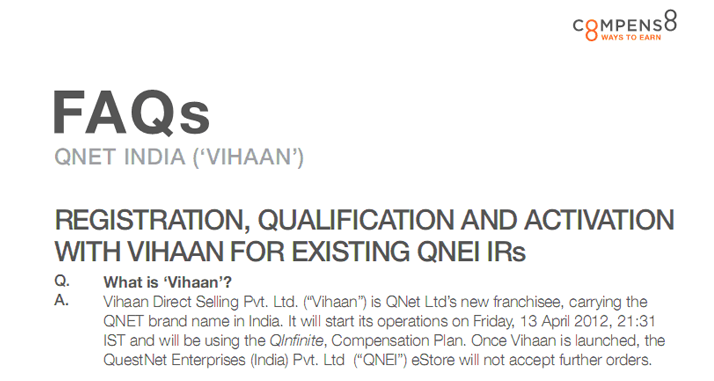 To read more about QNet on our wesbite, click here. 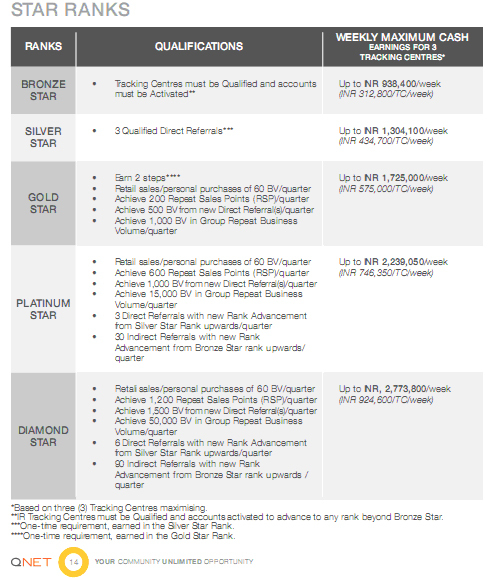 QNet says, its IRs can achieve rankings like Bronze Star, Silver Star, Gold Star, Platinum Star and Diamond Star, depending upon, how much he and his network or down lines sells. QNet claims that a Diamond Star can earn up to Rs27,73,800 (Rs27.7 lakh) per week while the same for a Platinum Star would be Rs22,39,050 (Rs22.4 lakh) a week. The money earned by a Diamond Star in QNet is almost the same that Mukesh Ambani of Reliance Industries (RIL), India's richest man as per the Forbes list, earns every week as salary (Mukesh Ambani forgoes Rs23.82 crore from his pay package ). We all have heard about Mr Ambani and his wealth. However, nobody knows how many Diamond or Platinum Stars are there in QNet's MLM network. If you know, then please share it. QuestNet Enterprises was operating QNEI eStore, a platform from where IRs, which is how the investor-dealers of QNet are described, could place orders or buy products and also enrol new recruits. After launching Vihaan, the company asked all its old IRs to mandatorily register under the new business name in order to receive their commissions. It is pertinent to mention that the big crackdown on its operations also occurred in Chennai when QNet operated under the name GoldQuest and sold numismatic coins. You may also be interested in reading about the many other MLM schemes that Moneylife covers. Click here to read about them. The company Qnet is celebrating VCon from 3-7 May. As a present,yesterday late night, I posted lot of comments on numerous pics uploaded on Instagram. I also posted on VChief Pathmans account. Unfortunately, they kept deleting my posts and had to ultimately block me. If each one of us, Indians, takes to instagram and starts posting messages like me, then they would have to either block us or abandon their account, which is their money making tool. You can start with Qnetofficial,TheV, Pathmans account, etc with phrases like Pyramid Scheme, Qnetscam, Franchise Fraud, Police arrests, court cases,Cheating, etc. They cannot stop us if we all work as one unit. Hope we all teach them a lesson and save other fellow Indians. Chief minister Devendra Fadnavis has promised to make a detailed inquiry of the alleged irregularities by the QNet multilevel marketing company and take action against the offenders, said BJP spokesperson Madhav Bhandari on Saturday. Former union minister P. Chidambaram’s wife was a legal counsellor with the company. The QNet company, which was earlier known as Goldquest, has cheated 12 lakh people to the tune of thousands of crores of rupees. The court has rejected anticipatory bail to the accused in this case. When the CM was contacted about this, he promised to make a detailed inquiry and take action. If necessary, he said that the CBI’s help would also be taken, said Mr Bhandari. The party spokesperson demanded that the role of former Union minister P. Chidambaram and his wife needs to be probed in this case. “Mr Chidambaram’s wife was a legal counsellor of the concerned company. Taking note of complaint registered by a lawyer from Chennai, the Central Vigilance Department handed over the case to the CBI. The complaint also has a mention of former Union minister Shashi Tharoor. However, the CBI did not investigate the matter during the tenure of Congress government at the Centre,” he alleged. In Maharashtra, the wife of Gurpreet Singh Anand had in 2013 filed a complaint of fraud against the company. However, there was not much inquiry during the Congress-NCP regime. But since the court has denied anticipatory bail to other accused, including sportsman Michael Ferreira, the investigation can be expedited. Many sensational things are expected to come out in the investigation as the CM has promised to carry out a detailed probe in the case, said Mr Bhandari. A group of investors in the QNet multi-level market case on Sunday gathered near Holy Family Church and marched as a protest and public awarness against ponzi schemes. The protesetors reached at the house of accused Padma Bhushan Michael feriera in the QNet cheating case. The protesters were holding placards that read, Michel Ferriera Shame Shame! and Ban QNet". "We chose Bandra for protest since most of the accused in this scam reside here. We had informed the police in advance and stated that the peaceful march will be for awareness about such fraud schemes and protest against such ponzi schemes," said Gurpreet Singh Anand, the first complainant in the QNet cheating case. He added that thgough it was his birthday but he did not spend time at home and was busy in the awareness drive. Similar protests were held in New Delhi, Bangalore and Hyderabad on Sunday. Last month a special MPIDA court rejected the anticipatory bail plea of Michael Ferreira, winner of the World Amateur Billiards Championship and a Padma Bhushan recipient, and four others in the QNet case. They have approached the Bombay High Court for anticipatory bail. Ferreira, 77, and others had applied for anticipatory bail in 2014. The economic offences wing of Mumbai police, probing the multicrore Qnet scam, has issued notices to Indian Super League (ISL) officials to gather details about taking sponsorship from the tainted company. Qnet had made celebratory association as the official direct selling partner of Goa Football Club (FC Goa) throughout the Indian Super League 2015 season, from October to December. FC Goa is a part of the ISL football league tournament. Sources said the police are trying to find out the how the proceeds of crime of a company under serious investigation, have been used to sponsor the team. Police are also baffled as how the Qnet managed to generate money when its accounts have been seized. "We have sum moned ISL officials to understand the amount and flow of money in their sponsorship from the Qnet company which had defrauded several investors," said an official. The fight against the Qnet scam wheré more than 7000 crores of rupees has been laundered out to foreign shores from India has just got bigger. The Saradha Scam which started mainly in Bengal looks relatively smaller compared to the Qnet scam which had defrauded people across various cities like Mumbai,Delhi,Bangalore,Hyderabad etc for over a period of 10 years. To unite and protest against this MLM scam plaguing India, all victims,activists, are requested that they gather outside Holy Family church,Hill Road,Bandra West at 10.30 A.M. tomorrow 24th April,2016. Various press and media agencies will be present to cover the event meet and address grievances to authorities. The current government has taken note of the Qnet scam and matter will be taken up at upcoming Parliament session. All Indians are cordially invited to support the cause and join in the protest. We need to end the scam by spreading awareness and recover the money taken away by the scamsters. QNet, the MLM has resurfaced in India; will people be duped again? QuestNet and GoldQuest, which all but closed down in 2009, have emerged bigger and stronger as QNet. But the hype and hard-sell by this MLM company to ensnare people into enrolling distributors and hawking lifestyle products such as watches, gold coins, bio-discs, herbal products and travel packages is worrying. Will it also go the SpeakAsia, Stockguru and NMart way while regulators do nothing? QuestNet and GoldQuest, multi-level marketing (MLM) companies that had shut shop in 2009 following police action are back with a bigger bang. They now calls themselves QNet and is thriving in an environment where tens of thousands of Ponzis and MLM companies are able to lure people into believing that they have the formula to instant riches and a high growth career. Like SpeakAsia, QNet is also registered in Singapore and has been banned in many countries, including Iran. It has a Hong Kong-based founder Dato’ Vijay Eswaran, a Malaysian by birth and an Indian by ethnicity, who is photographed hobnobbing with the Prince of Saudi Arabia, in order to enhance its credibility in the Gulf. The last time around, QNet was being evangelised by former World Billiards champ Michael Ferriera, as well as some former national cricketers. This time, it is being hard-sold by senior corporate executives, including heads of multinational companies, who have been forced to quit in the 40s and 50s, having fallen off the career ladder. Moneylife has received emails from several worried readers asking us to bring the “QNet scam” to the attention of regulators before it dupes their friends and relatives already ensnared by the hard-sell. One reader says, “QNet dealers are now targeting call centre employees, IT professionals and housewives on the promise of helping them earn extra income.” “QNet,” he says, “has small office, which it refers to as a “Grooming Centre” at Bandra in Mumbai. Its dealers and agents, however, rent out conference facilities for their rousing hard-sell which, like the Amway meetings, usually happens on a Sunday morning. To become member, you have to buy products—exquisite watches, holiday package, Chi-Pendants, gold and diamond jewellery—which are in the range of Rs1 lakh to Rs2.5 lakh and then to start earning commission; you have to make six other people to buy products”. But this is the simple option. The ‘packages’ go up to Rs6 lakh or more too. Also, there are apparently different schemes and packages being sold to different investors, rather than one clear product or service. For instance, Anil Mehta (name changed) a certified financial planner has this to say. “QNet is projecting that it can create over lakh billionaires through its Ponzi scheme. 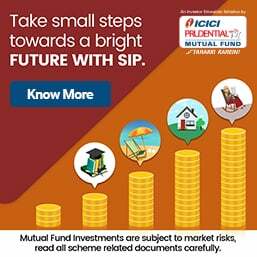 All you have to do is to invest once—say Rs5lakh and you will get back Rs 5lakh every week for the rest of your life. I know you will laugh, but this is exactly what they are projecting”. He says, since they claim to be a global company, they have managed to get bank managers, software professionals and insurance agents to get involved and evangelise this scheme. Manoj Arora (name changed), a chartered accountant and management consultant tells us how he decided to string along a QNet ‘operative’ to understand its modus operandi which promises to make you a millionaire in two or three years. He was scandalized at what he discovered and says, “QNet is just not about Amway-esque MLM but a Stockguru-type pyramid scheme. The premise is to get more and more people to invest Rs1 lakh to Rs6 lakh in an 'e-commerce' venture. They make you owners of QI group by selling three shares for every Rs1 lakh. How does that generate returns? The victims who are enrolled into the scheme, in turn hunt for newer victims to buy into the Ponzi. They are entitled to get 14% of share capital they or their victims raise. The scam is proliferating through social media like Linked-in to find newer targets. This reader had stored names and screenshots of people canvassing QNet from their profiles on Linked-in. Well, the company had a chequered past. In 2008-09 it was making waves like it is today. At that time, it flaunted powerful political connections (at that time a GoldQuest executive, K Preetha had said that Nalini Chidambaram was a legal advisor. This was after we pointed out that that the connection was highlighted at its meetings to recruit/ensnare new agents). However, QuestNet virtually folded-up after the Chennai police arrested several employees and the business was in completely disarray. At that time, QNet’s Singapore-based Director of Corporate Affairs, Zaheer K Merchant had attempted to convince us that the business model was fair and in line with the activities of other direct marketing and MLM companies such as Amway, Tupperware and other multinationals which were members of the Indian Direct Selling Association. He also tried to explain the problems at Chennai. Interestingly, QNet’s response was to organise a junket for journalists to Hong Kong to show that the company was not running a ‘scam’. This writer also received an invite, which we DID NOT accept. J Mayer, the Managing Director of QI Group had then written to say, “I believe that you are familiar with the names QuestNet and GoldQuest which have been in the media spotlight in Tamil Nadu and other areas of India for about a year or so. Unfortunately, I am aware that the names QuestNet and GoldQuest do not have a positive image in the minds of either the media or the general public at this present moment. Due to the legal challenges that both the companies have been facing, in India for over a year now it has unfortunately led to both companies being forced to halt their operations and temporarily close down their offices. However, the companies are by no means non-existent. Thus the MD of QuestNet India, Ms Pushpam Appalanaidu has not been in any position to make media statements or invite the media to an open forum to answer questions about the two entities. As we continue to defend our case in the court of law to prove our legitimacy, we would like to take the opportunity to show you that QuestNet and/or GoldQuest are not a ‘scam’ or a ‘gold coin fraud’ company as it has often been portrayed in the press this past year. QuestNet Ltd, the international company with which QuestNet India is affiliated is headquartered in Hong Kong and through representative and agent offices, has a presence in over 30 countries worldwide. The international company has been in the multi-level marketing business for about 11 years and caters to the needs of over 4 million customers in more than 100 countries worldwide who have taken advantage of the business opportunity provided by QuestNet to be a direct sales professional. In order for us to show you the real face of QuestNet and share with you the story of the company that has changed millions of lives worldwide, we would like to invite you to visit our corporate headquarters in Hong Kong, where you can see for yourself our global infrastructure, meet with our multinational customer support team, go on a tour of our facilities including our warehouse from where thousands of products are shipped worldwide on a daily basis, meet with the senior management of QuestNet International and learn about the investments the company has made in India with a view of long term commitment to the country”. This time too, we reached out to QNet and Mr Merchant has agreed to answer all out queries. Accordingly, Moneylife has emailed several questions to QNet and we are awaiting answers which will be appended to this report. Since then, Moneylife has done extensive work on all MLMs and come to the conclusion that all of them fall foul of the Prize Chits and Money Circulation Schemes (Banning) Act, 1978. We have also made representations to the Prime Minister’s office to ban MLMs altogether or allow them to operate under a clear regulatory framework under a designated regulator. Today, while tens of thousand MLMs and Ponzis are cheating people no ministry or regulator is in charge. The ministry of corporate affairs (MCA) does not even require these companies to be incorporated in India. This ludicrous situation persists at a time when there is such heated debate about legitimate foreign direct investment in retail and insurance. Look at the sadness of people in this state then, those who are duped by QNET. The torture they had given everyday after my office and taking away my weekends!! Every other day, there is news about people getting cheated through “earn-double-money” in less than a year run under the multi-level marketing (MLM) model. While the ministry of corporate affairs (MCA) appears to have woken up by the financial mess and menace created by thousands of MLM companies, the watchdogs or regulators who have the powers to stop all this, on several occasions, are found to be merely watching things as mute spectators. Take for example, SpeakAsia and N-Mart. While SpeakAsia conned lakhs of people by promising multiple returns on the ‘investment’ by just filling up mundane surveys, N-Mart promised huge ‘income’ just by becoming its members and purchasing daily need items from its branded shop. The promoters of SpeakAsia are absconding, while N-Mart promoters were not so lucky. Due to prompt action by Vijaywada-based activist Shyam Sundar and his organisation Corporate Frauds Watch and the Andhra Pradesh (AP) Police, promoters and directors of NMart are cooling their heels behind bars. Last month, the AP High Court dismissed a writ petition filed by NMart promoter Gopal Singh Shekhawat. But more about Shekhawat and his N-Mart later. Over the years, we at Moneylife had exposed several such fraud MLM or ponzi companies and alerted readers about these fly-by-night operators. At the same time we also informed the Reserve Bank of India (RBI), Securities and Exchange Board of India (SEBI) and Insurance Regulatory Development Authority (IRDA) about these companies. Unfortunately, except on few occasions, these regulators neither replied to our communication nor have they initiated any action against these fraudsters. What is more shocking is that some of the known MLM operators are found sidelining prohibitory orders of SEBI. Take for example, despite SEBI’s order issued dated 9th July, Jaipur-based NGHI Developers neither stopped collecting money from people nor did it refund any amount. The company was collecting funds from the public for developing plots of land through its plans, terms as collective investment schemes (CIS) by SEBI. The CIS, where an entity pools in money from investors for certain pre-specified purposes and later distributes the profits or income, come under the ambit of SEBI. While hundreds of companies have engaged in CIS activities in the country, just one such entity is registered with SEBI to undertake such kind of business. Some of the most common CIS are related to investments for real estate properties, plantation and agriculture industry, art funds, time-sharing schemes and multi-level marketing (MLM) schemes, among others. As per SEBI data, more than one lakh investor complaints are currently pending with it in connection with such schemes, and the matter is sub-judice since long in most of the cases. Moneylife first exposed the lies of SpeakAsia in October 2010 . However, due to inaction by the regulators, the company grew very rapidly. In fact, within a short span of eight months, it claimed to have enrolled over 20 lakh members. While India’s total investor population has fallen to 80 lakh, SpeakAsia managed to lure about 20 lakh people into its get-rich-quick scheme. But nobody really bothered to look into the case until some TV news channels stepped in and put pressure on the government to act. Unfortunately, due to the lack of clarity in regulation and prompt and fast action, SpeakAsia officials, who were present in full force on 16 May 2011, later vanished. Except, the company’s chief operating officer Tarak Bajpai, all others including chief executive Manoj Kumar managed to escape. In fact, the SpeakAsia court cases are not being fought by the company but by some early (beneficiary) members under the banner of All India Speak Asia Panellists Association (AISPA). Another such MLM company exposed by Moneylife is Kerala-based Royal Life. After keeping its shop shut for over two years, the network marketing company has again become active and is luring gullible people to invest in its schemes. Royal Life claimed to be a promotional arm of ALGA Marketing Pvt Ltd, which it said was a “unique and innovative marketing plan.” Two years ago, Royal Life was found using the picture of Kerala chief minister Oommen Chandy. Currently, there is no image of Mr Chandy now but there are several images of people which the company claims to be some sort of “super achievers”. Coming back to NMart Retail and Gopal Shekhawat, this MLM also was able to gather over 15 lakh members in a short span. One of the reasons for this phenomenal growth was the use of popular TV stars in the company’s ad (http://www.youtube.com/watch?v=b33IERPzrf4). NMart used Jethalal and Daya, the two popular characters from TV serial ‘Tarak Mehta Ka Oolta Chashma’ in its ad. The use of popular actors from TV serials not only increased the member count for NMart, but also helped it to establish itself as ‘genuine’ retail company. Unfortunately, NMart, its promoters and members fail to understand a simple thing, if it walks like a duck, talks like a duck then it is a duck. NMart seems to be collapsing under its own weight as happens with majority of ‘successful’ MLM schemes. The question is when there are thousands of network marketing or MLM or ponzi or pyramid companies not only proliferating but also duping lakhs of gullible investors, why are the regulators behaving like the police from an old Bollywood movie. In any old Hindi movie, the police used to be last one to reach at the spot or climax. 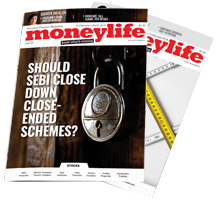 Last year, Moneylife Foundation, a non-governmental organisation (NGO) sent a representation to the prime minister, finance minister, finance secretary and governor of the RBI urging them to either completely ban MLM companies and schemes or bring them under the regulation of RBI or SEBI. Senior officials from investigating agencies have been saying that there are sets of people who move from one place to another floating a new MLM or Ponzi scheme. And yet neither the police nor the regulators do anything to arrest these known culprits. Earlier in February, SEBI decided to share names of over 500 MLM companies and their directors to MCA, so that necessary action can be taken to prevent these companies and persons from floating new business. While the MCA has decided to the publish names of fraudulent MLM firms and the menace these companies create, the real question is why prompt action is not taken by the police and the regulators. One of the problems in this is (and told by several officials, unofficially) is the lack of a complaint. This means unless somebody files a complaint against a MLM company, the police do not initiate any action. However, this needs to be changed and instead of waiting for a formal complaint, the police and regulators like RBI, SEBI or IRDA should initiate suo moto action against MLM or companies that run unauthorised CIS schemes. What is the government doing about Q Net ... they are hosting the Davis cup too at Bangalore ? CS Sundar Raju, Secratary of KSLTA, is also on the V Council plus they have the legal advise of Mr. Pinky Anand ... a Supreme Court advocate .. It is strange what money does to people and what people can do for money. These types of MLM or Ponzi schemes are difficult to identify at an early stage. They attract attention only after they have grown in size significantly. We cannot call such MLM or Ponzi schemes as investments and those people who get lured by such schemes as investors. People who fling money mindlessly without applying commonsense are acting in a foolish manner, certainly not like investors. It is like calling people who buy lottery tickets - entrepreneurs. Whenever someone promises abnormally higher returns, the question we need to ask ourselves is pretty basic and simple. Why? Why are higher returns being promised when cheaper means of raising funds are available for the one who is accepting money? If the intention is never to repay then any promise looks small. Any person who expects to get ‘abnormally higher returns’ in a relatively quickly is doomed to lose money; no regulator can protect these people who aspire to become rich quickly, simply by doing nothing. We do not have to depend on regulators or police to save us from these fraudsters. Remember. god helps those who help themselves. People can shield themselves from such crooks – by just refusing to part with their savings. There are a third category of people, they do not join the company or its products but, they join their friends of lifetime.. later realize that the real friend we understand that the real friend is dead long time back. I would be happy and very satisfied; if the regulators - remove any income to the sponsoring another friend. Upline has to take charge of this newbies success...the same applies to the each & every one...! Many of the people who were cheated by MLM fraudsters are illiterate labourers and coolies. There are legitimate, legal MLM companies and their are illegal pyramid schemes. Unfortunately many such pyramid schemes try to disguise themselves as MLM companies because they want to appear legal and legitimate. I have worked as a consultant with MLM companies in India and your country is indeed overrun with pyramid schemes. So much so that even those companies run by honest people offering real products of value feel they must employ aspects of the illegal schemes to be able to compete. MLM offers many benefits to those seeking to start a business and can provide a legitimate means to earn extra income. India should not follow the path of China and "throw the baby out with the bathwater" by banning all MLM operations. MLMs should be more regulated in India, absolutely. But not illiminated entirely. You have not specified the name of the "LEGAL" companies in India you worked as a consultant. It will be helpful for the investors if you publish the names of such 'LEGAL" MLMs. What is the role of Registrar of Companies? just registration of companies only? CBI or any other central agency must probe the role of registrar of companies in various states in money chain/ MLM/ network marketing scams. Scheme Act, 1978 against these MLM cheats. Authorities deliberately delaying a verdict in speakasia scam, which was sharply criticized by Judiciary, asking them are they not filing a single charge-sheet even after 2 years an more time, I don't know or am not interested to know where the case file is at present. Management is ready to payback everything, then what is the problem for court/RBI or I0...? I suspect that under the instruction of political masters - elections is a costly matter. 2014 Country goes to Poll,,,who will fund these people...?